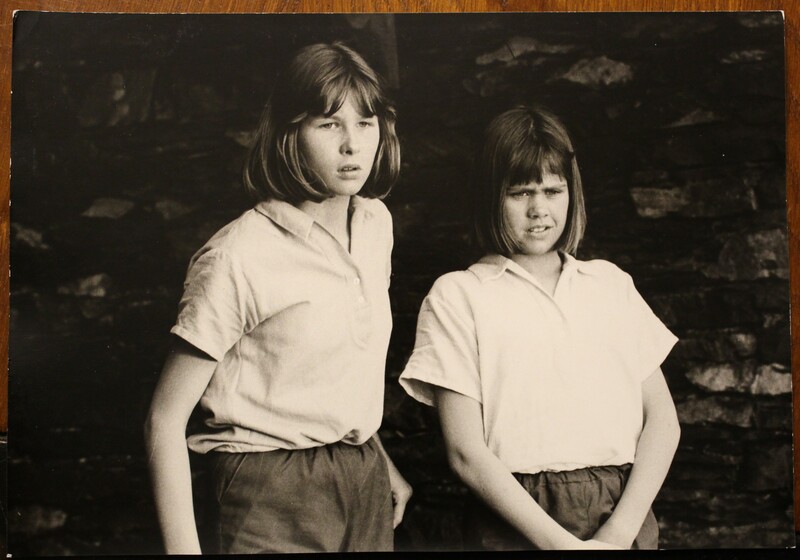 In the feature film ‘Swallows and Amazons'(1974) the part of Peggy Blackett was played by Lesley Bennett. She was an experienced dingy sailor and enjoyed the scenes on the houseboat although she told me she didn’t want the parrot to flap onto her shoulder, which was understandable. Its claws dug into mine. When I met up with Lesley in the Netherlands this summer, we looked though the photographs she’d been given by the producer and kept for posterity. If you don’t recognise the scene above it is because, although the shot was taken at Brown Howe, where the Amazon boathouse can be found, they were rehearsing the scene at Secret Harbour on Peel Island when the Blacketts find their boat has been captured. ‘She can’t have drifted against the wind.’ This was the first I knew of this. Perhaps they were waiting around for the camera to be set up or for a decision to be made about their red hats, which they were not wearing. This was rare. They wore them in every other scene. Lesley, who grew up in Kent, remembered my mother taking her shopping in Ambleside on one of our rare days off. “She had an appreciation of how important it is to buy a good top, explaining that she needed a selection for her work as a television presenter. I remember her waiting for ages while I tried on one after another.” I was amazed when I heard this. My mother only ever took me shopping once or twice when the first Laura Ashley shop opened in Cheltenham. This was deeply exciting but a rare treat. It was my poor father who was dragged from one shoe shop to another. It was difficult to find decent shoes in the ‘seventies. It was difficult to find decent clothes, that didn’t cost a fortune. There was a reason why dressmaking was so popular – we had to make our own garments. At the age of twelve I made a navy blue skirt for school so that it had a fashionably broad waist band. Flared dungarees were all the rage, worn with a stripy polo-neck or blouse with a large collar. 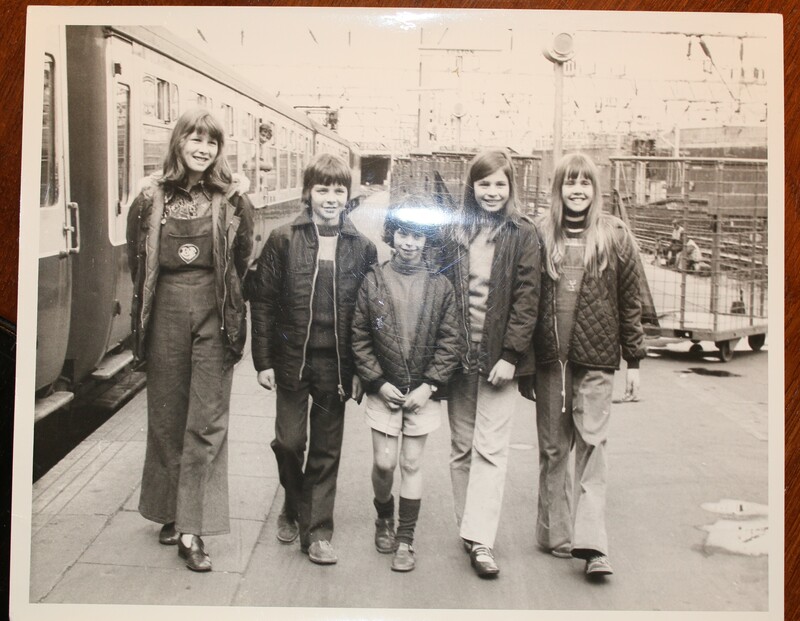 Kit, Lesley and I all wore these, although sadly my brushed-cotton dungarees grew rather short during the filming. Lesley managed to find what I’d thought was the ideal outfit for our afternoon film premiere, which I’m pretty sure she is wearing in the shot above. Although we were almost obsessed with clothes, they were not a subject people discussed with new acquaintances, which was a pity as it would have provided us something neutral to discuss with the press. “I remember the journalists at the hotel in the Lake District,” Lesley said, “and Claude saying, ‘Be careful what you say to journalists because they will turn it against you. '” However, when it came to film publicity Lesley was both enthusiastic and gracious turning up at a local school book fair and posing for newspaper photographers. I can see that tank-tops had come in by this time and it was possible to blow-dry your own hair. Lesley enjoyed drama at school and looked into going to RADA, but after auditioning for one film decided the acting profession was too precarious. I think we were both interviewed for parts, possibly the same part in the same film. It was set in Wales and involved rock climbing. I said I wasn’t scared of heights, which was a lie! Sadly it was never made. I told her that Ronald Faser wanted us both to appear in another movie but that the funding fell through. She wasn’t disappointed. I was able to tell her that there was an actress called Lesley Bennett of about our age who once had a part in the long-running soap opera ‘Coronation Street’ but she confirmed that this was not her. Lesley always loved meeting people wanted to travel, so went into marketing, working for Unilever on the first ‘Just one Cornetto’ campaign. She later branched out into international event management, which took her all over the world. She married a tall Dutchman and has two grown sons. They have a policy of visiting a different place each holiday, there by exploring different places, and they lived in Dubai for a while before returning to the Netherlands where she has been based since the early 1980s. Lesley looks back fondly on what she calls “The Swallows and Amazons era”, appreciating what recollections mean to those who have grown up with the movie and enjoy Arthur Ransome’s books. 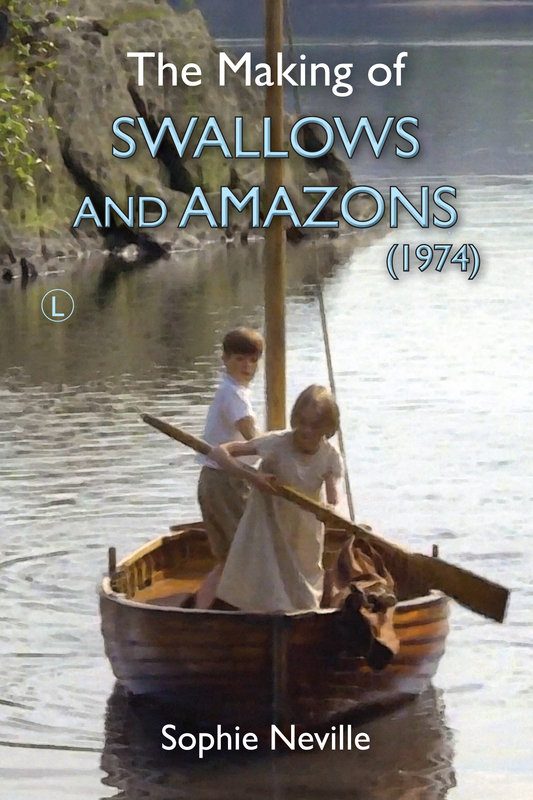 “Innocent films like ‘Swallows and Amazons’ (1974) appeal to those who know exactly how the books were written.” One thing she kept was the original film poster. Here she is with it more than forty-three years after the release. And she hasn’t changed a bit. I took the photograph of Lesley with her failm post at the airport hotel in the Netherlands. It was so good of her to bring her file of photos. There are a few more. Please let me know if y ou’d lile to see them on the blog. Yes! I love seeing these photos. Please share more of them. This is a very enjoyable post. Thank you! Thank you for taking the time to leave a comment. It is most appreciated. And, thinking back to how Lesley brings Peggy to life in the film, she reminds me irresistibly of Sally Thomsett playing Phyllis (‘who means well’) in the classic Railway Children film. And I’m certain that Lesley would have carried on the Peggy part wonderfully in say ‘Winter Holiday’, when she nervously but determinedly took on Nancy’s mantle. Warmest good wishes to you, Lesley. It was amazing to see Lesley’s photographs and wonderful to see her after so long. Pingback: Delightful reading as always Sophie :) Thank you for sharing the life of “Peggy”. Send thanks to Lesley lovely photo she looks just the same. – Once Upon A Time Vintage! Thank you for your encouragment. Please let me know if you have any questions. 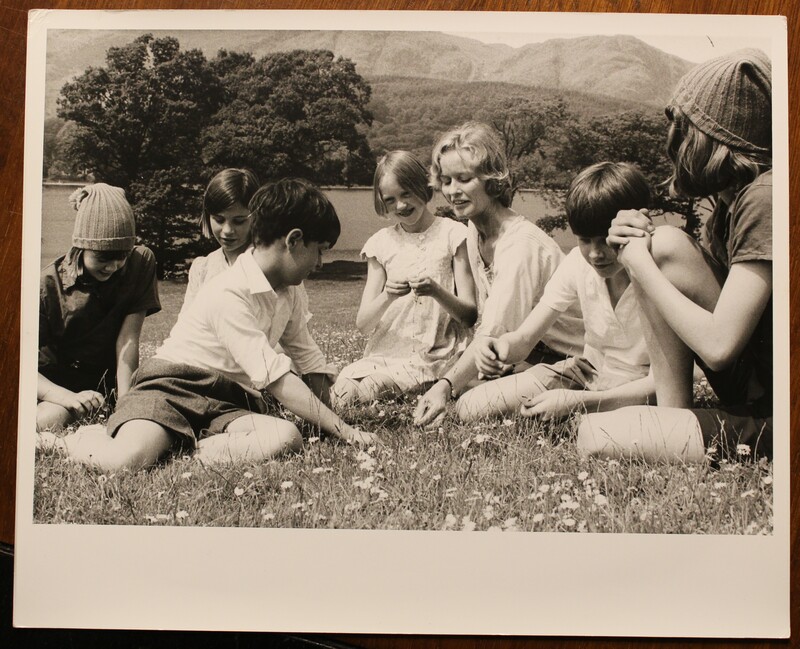 There are a few more photos taken by Lesley on location in the Lake District. I wanted to avoid becoming repetetive but let me know if you’d like to see them! Enjoyed both parts of your reunion with Mate Peggy . It must have been good to catch up on the 40+ years which have passed ( so quickly ) since S&A mk.1 . Sophie , can I get a kindle version of your NEW version of the making of Swallows and Amazons . I do hope so . I will ask The Lutterworth Press when they are bringing it out, as they did have plans. I am hoping that schools and colleges will be able to use the paperback for Drama/Film/Media Studies. Do insist your library orders a copy! 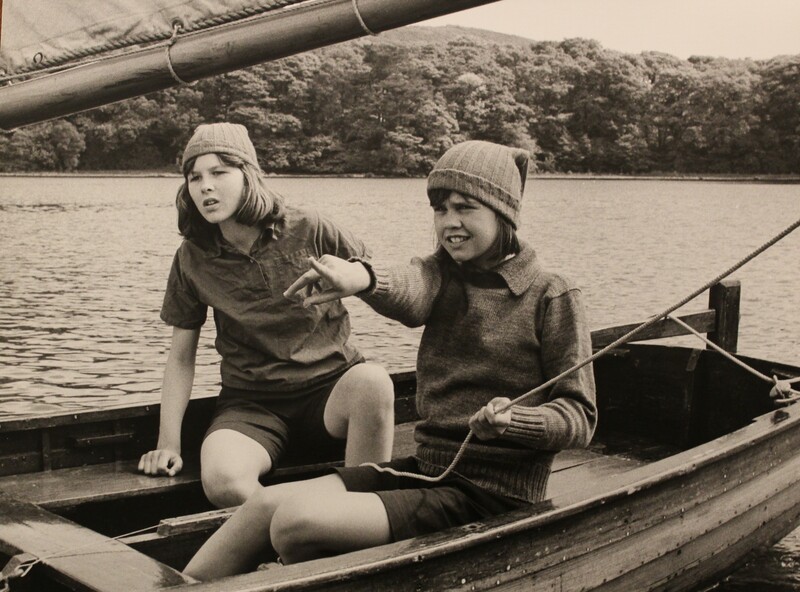 In the meantime, we have uploaded a 2nd edition of ‘The Secrets of Filming Swallows & Amazons(1974)’ onto Kindle. If you have the first version, you should be able to upload this revised edition free of charge. I’ll post more about Mate Peggy. Sophie , thank you so much for the swift reply . Checking my Kindle I find I now have `S. A. + Coots` and your 1st. edition of `Filming of S. & A. ` on my Kindle – lots of work from my wife and daughter !! I shall contact Lutterworth Press tomorrow !!!! Do re-load the 2nd edition for free. It has been hugely improved. The test is similar to my paperback on ‘The Making of Swallows and Amazons’ but with a few more stories. Please let me know if you see any typos. They creep in. With all these photos from Lesley will soon have enough new information to bring out a third edition. It is a work in progress. I wish I had been able to find Lesley before but her parents died, she married years ago and was in Dubai when I began writing. Sophie , thanks again for a swift reply , this time with the info I needed – that I CAN now download a Kindle 2nd. edition . So pleased that Lesley was able to provide you with pictures , many either forgotten or even unknown , and stories you could both share of a time experienced by the two of you in 1974 . Thanks again , Martin Robinson.